"Modern Cable Television Technology should be in the library of any company contemplating video services. It combines thorough coverage of its subject with a moderate amount of technical detail, resulting in a volume that both engineers and non-engineers alike will find useful. Although the book is clearly intended for readers having technical responsibilities related to networks providing video services, much of the material will be helpful as general background for non-technical personnel. In addition to the chapters we note below, the book provides two excellent appendices detailing channel allocation plans as variously implemented and video waveforms, a comprehensive glossary and an index. Each chapter provides helpful end notes for readers wishing to delve further into any specific question. 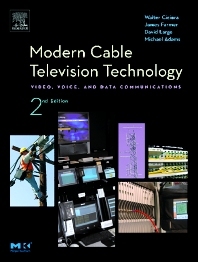 The book is written by four authors, each of whom carries the highest engineering credentials within the cable television industry." David Large is a Principal in the consulting firm Media Connections Group. He is a Fellow Member of the SCTE, a Senior Member of the IEEE, a member of the NCTA Engineering Committee and a member of the NCTA/EIA Joint Engineering Committee. James Farmer is the Chief Technical Officer and Executive Vice President of Quality at ANTEC. A respected industry expert and communicator, Jim is widely published and is active in the National Cable Television Association (NCTA), the Society of Cable Television Engineers (SCTE), and the Institute of Electrical and Electronic Engineers (IEEE), among others.